Career nights from Budimir and Stewart lead Lions to 87-78 win over Cameron. 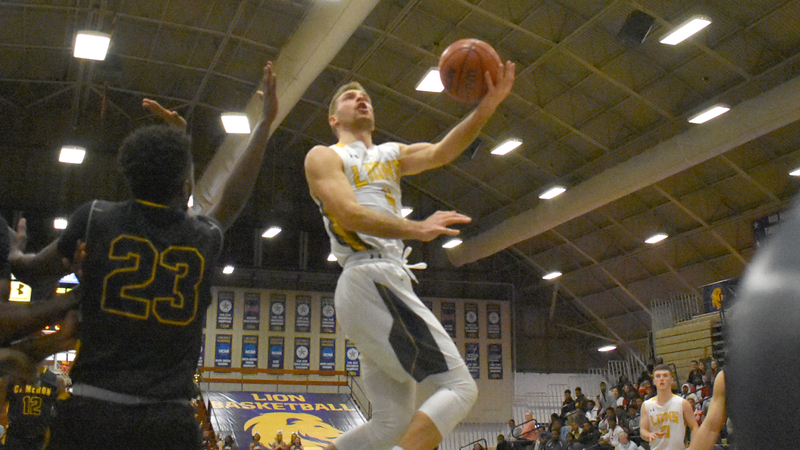 COMMERCE – The Texas A&M University-Commerce men’s basketball team defeated Cameron University 87-78 on Thursday night on Greek Night at the Field House. The Lions and Aggies were very close for much of the night before the Lions pulled away at the end of the game. The win brings the Lions to 17-5 on the season and 9-3 in the Lone Star Conference. The Aggies fall to 8-14 and 4-8 in conference play. The Lions return to action on Saturday at 4:00 p.m. against MSU Texas. The game is the back half of the “Fill The Field House” doubleheader presented by the Enrollment Management Division. Admission to the game will be free of charge. – Srdan Budimir (Karadjordjevo, Serbia) led all scorers with a career-high 24 points on 9-of-11 shooting. He shot 6-of-7 from three-point range. – Wayne Stewart (Philadelphia, Pa.) had a fantastic game with 21 points and also pulled down nine rebounds. – Willie Rooks (Houston-North Forest) had a double-double with 13 points and 12 rebounds. Carson Tuttle (Mukilteo, Wash) had 12 points and 6 assists. Tuttle also led the Lions in minutes with 38. – The Lions shot an impressive 54 percent from the field and 52 percent from three-point range. Cameron shot 46 percent from the field and 48 percent from long distance. – After a tie game at halftime, the Lions shot 62.5 percent from the field in the second half to earn the victory. Both teams went back and forth in the first few minutes of the game. With the score tied at 13, Cameron went on a 7-0 run to gain a lead. The Lions answered with a series of their own to make the score 24-20 in favor of the hosts. Tuttle and Budimir connected on three consecutive three-pointers to put A&M-Commerce on top. Both teams finished the half strong and went into the break tied at 34 apiece. Stewart provided a spark off the bench, scoring seven points and pulling down six boards in the opening period. The Lions shot 44 percent in the first half on 11-of-25 shooting and shot 40 percent from three on 6-of-15 from behind the arc. Budimir led the Lions with eight first-half points. Rodney Brown (Beaumont – West Brook) got the crowd on their feet early in the second half with an alley-oop dunk to give the Lions an early 38-36 lead on the assist from Trey Conrod (Kilgore). Conrod, Tuttle, and Budimir proceeded to hit three three-pointers to put the Lions up 47-38 going into the first media timeout of the half. Cameron hung in the game, cutting the lead to four with as little as seven minutes to play, but the Lions held their ground and did not allow the Aggies to get within two possessions. A 10-4 Lion run in less than two minutes was sparked by a pair of Stewart three-pointers, and Rooks’ three-point play helped put the Lions ahead by double digits at 70-60 with just over five minutes to play. Budimir electrified the crowd in the final minutes as he scored 11 points in the last five minutes including a trio of three-pointers. Budimir’s final three extended the Lions lead to 18 points at 85-67 with two minutes left. Cameron narrowed the deficit in the waning stages, but the Lions proved to be too much for their guests, earning the season sweep. Lions explode out of the gate with a 91-58 win over Cameron. COMMERCE– The Texas A&M University-Commerce women’s basketball team defeated Cameron 91-58 on Thursday evening. The Lions jumped out early on the Aggies and never looked back. The win propels the Lions to 14-7 on the season and 9-4 in the Lone Star Conference. The Aggies fall to 7-14 and 4-9 in conference play. The Lions remain home on Saturday to host the MSU Texas Mustangs. The game will start at 2:00 p.m. at the Field House and followed by the Lion men versus the Mustangs. The doubleheader is part of “Fill The Field House” presented by the Enrollment Management Division. Admission to the game will be free of charge. – Ekaterina Zhibareva (Liske, Russia) led the Lions with 17 points in the game. She finished just one rebound short of a double-double with nine boards. – Princess Davis (Shreveport, La.) had 16 points and seven assists. – Chania Wright (DeSoto) had 13 points and had a double-double with a career-high 12 rebounds. – Alexis Bryant (Pflugerville) added 12 points. Mykiel Burleson (Pflugerville) also made her way into double digits scoring with 11 points. – The Lions shot 49 percent in the game, including 55 percent in the first half. The Lions also shot 36 percent from three in the game. – The Lion defense held the Aggies to just 38 percent shooting for the game. The Lions got off to a sizzling start, taking an early 18-5 lead before the four-minute mark even occurred. Bryant had nine old points in the paint to expand the Lions lead. Cameron cut into the lead, but the Lions kept a comfortable lead after the first quarter, leading 23-12. The Lions shot a very efficient 67 percent in the quarter. 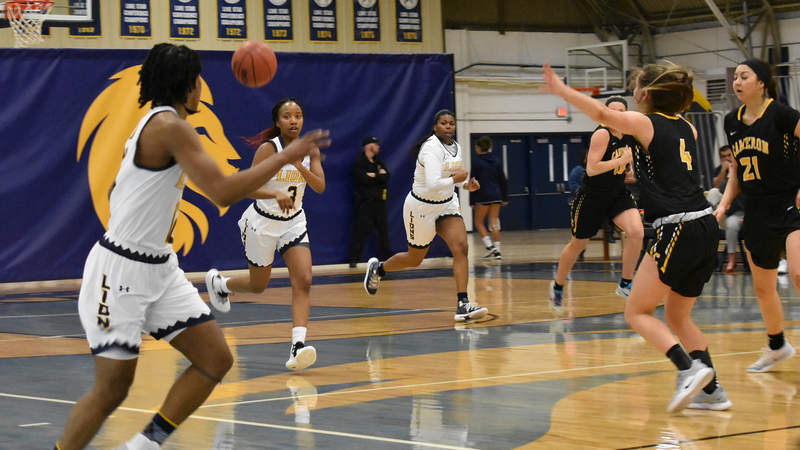 The Lions started hot in the second quarter, extending their lead to 31-15 with Wright scoring five quick points in the quarter to help the Lions. Cameron struggled to cut into the Lion lead as Zhibareva scored six points in the quarter. Davis also scored four points in the quarter and carved the Aggies defense apart, leading fast break after fast break. The Lions took a 41-24 lead going into the half. Zhibareva and Bryant both led the Lions with 10 points in the half. Davis added nine points, and Burleson had seven. The Lion defense held the Aggies to just 36 percent shooting in half. The Lions, just like they did in the first half, started the second half on a tear. They went on a 15-0 run to extend the lead to 56-27. Zhibareva led the Lions in the third, scoring six points as they took a 28-point lead going into the fourth. The Lions extended their big lead to 33 to conclude the game at 91-58. Jocelyn Pierce (Argyle) was very efficient in the fourth with eight points on 1-3 shooting and 6-7 from the free throw line. COMMERCE– Texas A&M University-Commerce softball coach Richie Bruister has announced the program has added a home doubleheader against No. 20 Arkansas Tech to the schedule. The No. 9 Lions and the Golden Suns will face off on Wednesday, Feb. 13, with the first game set to begin at 3:00 p.m. The doubleheader will serve as the Lions’ 2019 home opener. A&M-Commerce and ATU met in the second game of the season, with the Lions defeating ATU 8-4. The Lions are currently 5-1 on the season, while ATU holds a record of 3-3. Season ticket holders will receive complimentary admission to this doubleheader, and will not need to buy additional tickets. 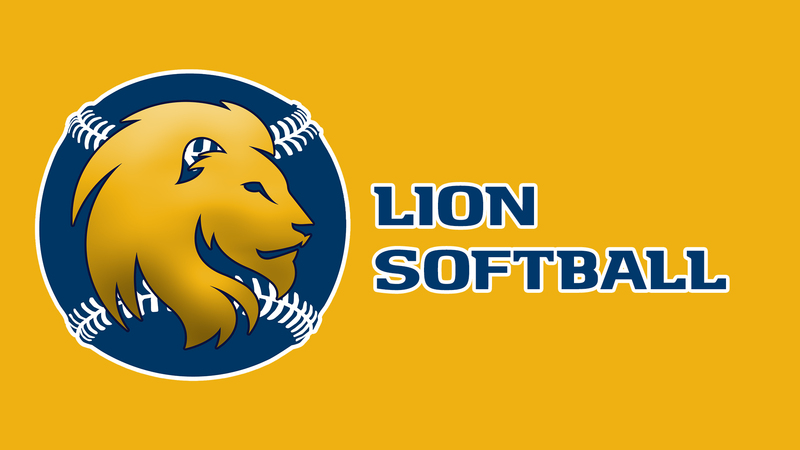 Season tickets for Lion Softball home games at the John Cain Family Softball Field are available for $70 with a total of 23 games spanning 14 different dates. Tickets can be purchased by visiting WeAreLionsTix.com, calling Lion Sales & Service at (903) 468-8756, or visiting the LSS Box Office in the Field House during business hours. Kinsie Hebler named one of 50 Players to Watch for Schutt Sports / NFCA DII Player of the Year. 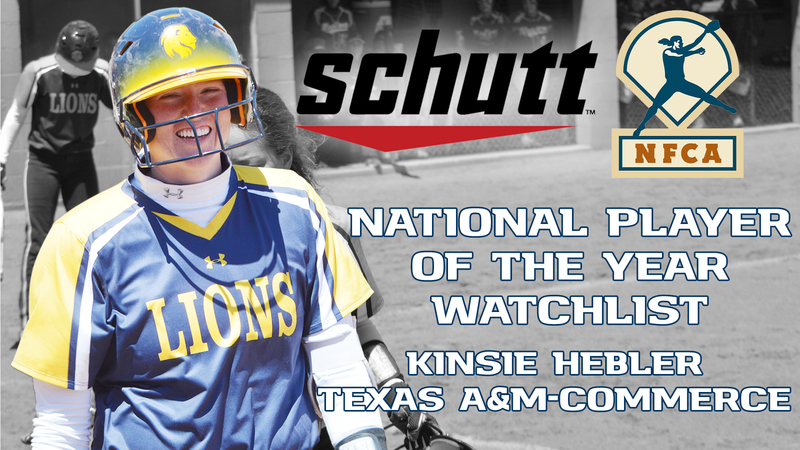 LOUISVILLE, Ky.– Texas A&M University-Commerce utility player Kinsie Hebler has been named one of 50 players to watch in the 2019 Schutt Sports/NFCA Division II Player of the Year Watchlist. The list was released on Thursday by the National Fastpitch Coaches Association (NFCA). Hebler– a junior from Cypress (Cy-Fair)– was a top-25 finalist for 2018 NFCA National Player of the Year after a tremendous sophomore season. She was named a First Team All-American by both the NFCA and the Division II Conference Commissioner’s Association, as well as an Honorable Mention All-American by Fastpitch News. A starter in all 54 games of the Lions’ historic 2018 South Central Regional Championship campaign, Hebler finished third in the nation in RBIs, sixth in home runs and 10th in both slugging percentage and total bases. She had 13 game-winning RBIs last season. She finished the season with 19 home runs, 73 RBIs, three grand slams, a .413 batting average, a .505 on-base percentage, and a .844 slugging percentage. Hebler has the potential to set multiple program records this season, including most career doubles, most career home runs, most career RBIs and most career walks. Hebler is one of 31 players on the list to have been previously named an NFCA All-American. She is one of just six players from the Lone Star Conference to make a list. Hebler and the No. 9 Lions are 5-1 to begin the 2019 season. They return to the diamond on Friday as they start their second tournament of the season. A&M-Commerce will play five games over the three-day tournament in San Antonio. Their first game will be played on Friday at 12:15 p.m. against New Mexico Highlands, with games against St. Mary’s, Drury, Regis and Colorado School of Mines to follow. The Lions will then return to Commerce for their home opener on Feb. 15. Bailiff announces 52 signees on National Signing Day 2019. 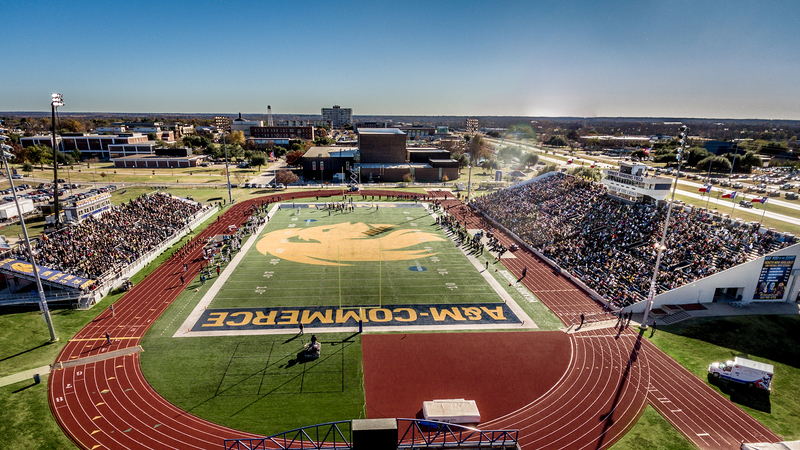 COMMERCE – Texas A&M University-Commerce head football coach David Bailiff introduced 52 signees on National Signing Day in the first signing class for the 20th head coach in the history of Lion Football. “I was really pleased with our signing class today,” Bailiff said. “I’ve got to thank Yogi Gallegos and Tim Bleil for staying here and pushing things along while I filled out the staff. I think we hit the ground running and came up with some great players. “I think we filled many spots that we feel we needed to fill. We got some massive interior defensive linemen who are athletic. We got some tall, developmental offensive linemen. At the skill positions, we got some tall, long outside receivers as well as some speed guys at the slot position. A lot of them have excellent track times. We got defensive backs who can excel in both man and zone. In the coming weeks, we will announce the spring practice schedule. Lion Volleyball announces the addition of Lauren Flowers to the coaching staff. COMMERCE– The Texas A&M University-Commerce volleyball program is pleased to announce the hiring of Lauren Flowers as the team’s new assistant coach. A&M-Commerce head volleyball coach Craig Case announced the hire this week. 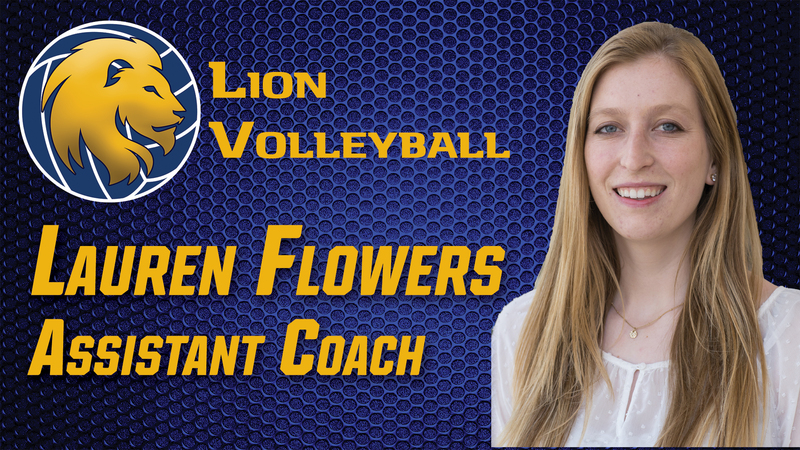 Flowers comes to the Lions after spending two seasons as an assistant coach at fellow Lone Star Conference affiliate UT Permian Basin. During the 2018 season, Flowers helped the Falcons to the most significant turnaround in program history. The team qualified for the LSC Tournament for the first time and made its first playoff appearance since the 2011 season. The team was able to defeat a nationally-ranked opponent for the first time in program history. During her first season at UTPB, Flowers was instrumental in the team’s recruiting efforts, which helped lead to the 2018 season turnaround, including hiring a junior college All-American and a future First Team All-Conference player. Before her time at UTPB, Flowers served as an assistant coach for two seasons at Western New Mexico under head coach Jim Callender. During WNMU’s first season in the LSC in 2016, Flowers helped coach LSC Defensive Player of the Year and All-Region selection Shannon Rich as the Mustangs qualified for the LSC Tournament. They selected two Mustangs as All-Conference and All-Academic players. In her first season at WNMU, Flowers helped the Mustangs finish second in the RMAC standings as the team narrowly missed a berth into the NCAA Tournament. Flowers helped coach the top hitting team in the RMAC with four All-Conference players as Callender went on to be named RMAC Coach of the Year. Flowers began her coaching career at Bethany High School in Bethany, Okla.
Before her coaching career, Flowers played at Azuza Pacific, where she helped the Cougars finish fifth overall in the 2011 NAIA National Tournament. She graduated with a bachelor’s degree in Liberal Studies in 2014. Lauren married her husband, Steven Flowers, in June 2014. The couple coached together at both WNMU and UTPB.